Starting a new business and plunging into the world of shop owners is not at all an easy task and everyone who has tried their luck in their sector knows how difficult things can get, especially when talking about marketing and promoting your business. In a constant fight with big retailers as well as the online environment, new shop owner needs to get creative regarding marketing techniques and sometimes things backfire. 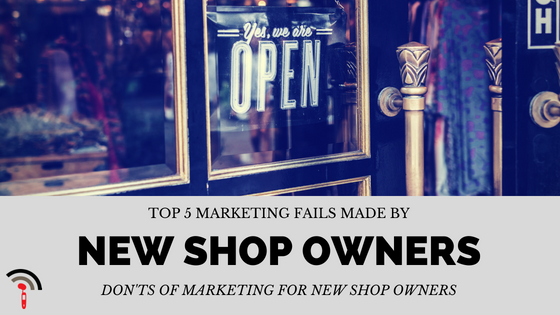 Here are 5 mistakes that are often encountered by new shop owners and how to avoid them. The number of shop owners and retailers that thing opening a new shop and adding a balloon door is more than enough for promoting themselves and letting people know a new business is open. Well, in such a crowded market like the retailing industry and with so many names and brands consumers are bombarded every day, just adding your name above the door isn’t going to change much. What you need is constant and sustained promotion through flyers, online ads and even your occasional contest to draw new customers and make sure they remember you. Somehow opposed to the previous point, the idea of going all in and spending the marketing budget for six months on a huge and flashy launch, isn’t a good way to go either. Instead, you need to devise a long-term plan and use your budget over a longer period of time so that you are constantly promoting your brand and make sure you remain relevant to your customers. Yes, a big and flashy launch will bring you a lot of customers that day, however, the chances are slim of them returning without a sustained marketing effort. That’s why marketing is an ongoing need you need to make plans to spread your budget across the year. Indeed, word-of-mouth is a very powerful marketing tool and if you are lucky enough, you won’t need to spend another cent on marketing and promoting your business thanks to the simple mouth-to-mouth recommendations of your products or services. Even so, you’re dealing with a two-edged sword here since just as happy customers are likely to recommend your shop to others and increase popularity, the unsatisfied ones have it very easy to spread negative feedback. After all, the customer is always right, right? Unfortunately, there’s no active way of stopping this phenomenon from happening, other than making sure you do everything right and people that enter through the door leave happy and satisfied. As mentioned earlier, online ads are a huge part of any successful marketing campaign. No matter if you own a flower-shop that doesn’t even have a website, promoting your shop online significantly increases your chances to get new customers. There are a lot of shop owners that thing online marketing is only destined for big companies and decide to steer away from that, leading to a very low exposure and a similar customer base. Again, you are dealing with a two-edged sword here as running customer loyalty campaigns can benefit your shop but it can also do harm. Appealing to small-scale loyalty schemes might help existing customers feel more valued and remember you better, however, some of them will feel that they’re poorly rewarded for something they were already doing. So, whenever you think about applying a loyalty scheme, do remember that it’s all about giving customers reasons to come back to you, not about collecting points or free stuff. Even though free stuff works like a charm as well.